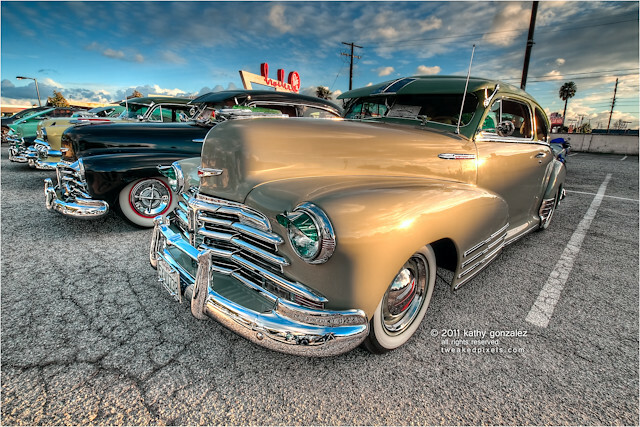 this line of chevys was at the old memories eastside charity event at the broiler yesterday evening. i got my better half to join me for this one and a couple of other shows today. good sport. thanks d.
the rain had stopped earlier yesterday, but the cold continues, with intermittent strong winds. the wind wobbles my tripod sometimes and messes with my shots, and throws them out of focus. guess i need to get a weight to help stabilize it from the shaking. there weren't as many cars as we expected, probably due to the weather, but still a few worth shooting. several people were very helpful about moving their chairs out of the way, so i could take a picture, so thank you very much. there were some cars that i really wanted to get, but the sun was busy going down, and was casting too much of a shadow across them, so i had to pass, or the location just sucked with all the posts and light poles screwing up the look. my hubbie ran into another photographer who cared to advise him that if he used a flash, you wouldn't need to use a tripod. the camera model my hubbie uses doesn't have a built-in flash. the guy said you can buy them pretty cheap. yup. usually, at this point my hubbie would have whipped out his iPad® and shown him that we do all right without it, but he didn't have it in his bag. he just handed him one of my cards and told him to check out my website to see what we get without using a flash. so, camera guy, i hope you didn't lose my card. please let us know where we can see your pictures, we'd love to see them.